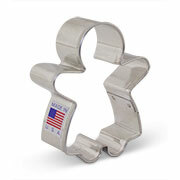 Everyone loves the Gingerbread Man Cookie Cutter. 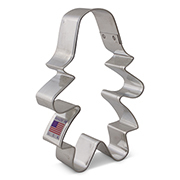 A Christmas Cookie classic, this cutter is popular for making gingerbread cookies, used as a stocking stuffer or given as a Secret Santa gift. 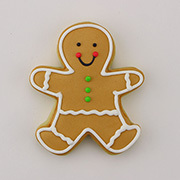 The Gingerbread Man Cookie Cutter can be used to cut fondant, cookie dough, fruit, sandwiches, filled with treats or used in crafts. 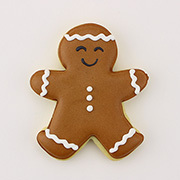 Cookies decorated by A Dozen Eggs. Size: 4 1/2" x 3 1/4"